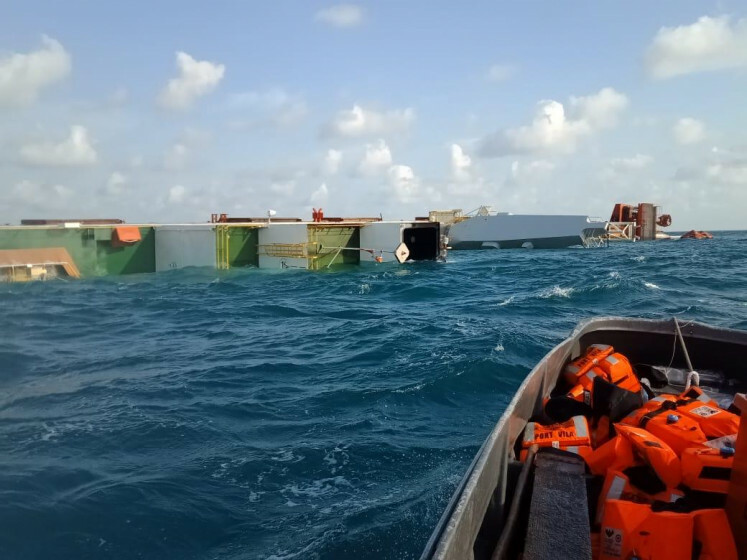 The Indonesian Navy has deployed several vessels after the Vanuatu-registered cable ship the MV Star Centurion collided with the Hong Kong-flagged tanker MT Antea on Sunday morning in Bintan waters, Riau Islands. The Singaporean authorities previously rescued some 20 crew members from the sinking Star Centurion, which was a vessel designed for undersea pipeline work. The Antea sustained damage to its hull in the accident at 6:30 a.m. on Sunday in Tanjungberakit. Based on images of the damage to the respective ships, it would appear the Star Centurion crashed into the side of the Antea. The Star Centurion capsized and sank within hours. Tanjung Pinang Naval Base commander, Cdre. Ribut Eko Suyatno, told The Jakarta Post on Monday that the incident occurred in Indonesian waters but both vessels reported it to the Information Fusion Center (IFC), a multinational maritime security body, in Singapore, which sent a search and rescue team to the site. An Indonesian Navy liaison officer at the IFC reported on the accident and the follow up to Tanjung Pinang Naval Base. “When the accident happened, we did not have a search and rescue team ready, so the Singaporean authorities handled it. This is in line with international law: whoever is close to the site, provides assistance,” Ribut said. The Navy has deployed the KRI Pulau Rusa, KRI Surik and KRI Anakonda to the location to prevent other ships from entering the area. Ribut said so far they had yet to find any indication of an oil spill. Tanjung Pinang National Search and Rescue Agency head, Budi Cahyadi, said the Antea had been moved to Singaporean waters.